Researchers should tackle challenges smallholders face in marketing indigenous vegetables, writes Alberto Leny. The soil in Chandipur village in southwest Bangladesh has become increasingly salty because of incursions of seawater. The situation became particularly acute in the aftermath of Cyclone Aila in 2009, which brought storm surges that broke embankments and flooded farmland. After 2009 vegetable crops planted in the ground there yielded only meager returns—if they didn’t fail completely. But for the past three years hundreds of villagers have enjoyed the bounty of so-called vertical gardens—essentially crops grown in a variety of containers in backyards and on the rooftops of their humble homes. Despite their modest size, these gardens produce quite a bit. 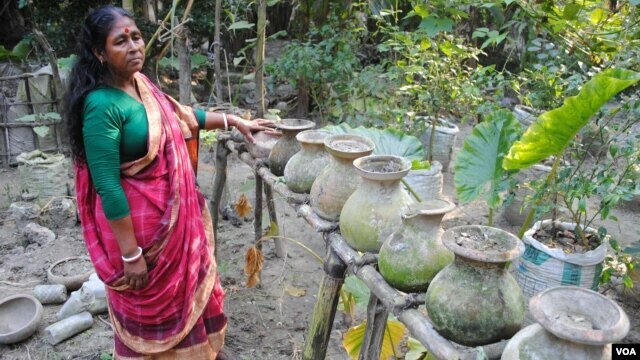 Working with local nonprofits WorldFish trained about 200 villagers in four districts in saline-affected areas of southwestern Bangladesh to make vertical gardens. Others not in the program have copied their neighbors’ designs after seeing how well they worked. WorldFish plans to expand the program to include 5,000 people over the next two years. 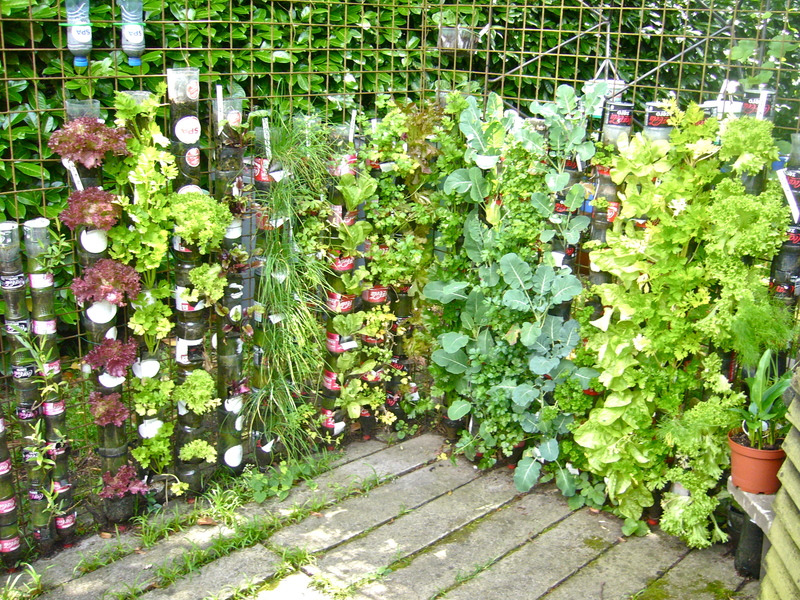 Growing the vertical gardens is a relatively straightforward process. Villagers harvest soil after the rains, around November, and use it later during planting season. They put the soil into containers and mix it with fertilizer made of dried water hyacinth, soil, coconut husks and cow manure. The containers range from plastic rice and concrete sacks to large, specially constructed “towers” made of simple plastic sheets encased by bamboo rings. To prevent waterlogging, the containers are raised off the ground on bricks and filled with brick chips that improve water circulation and drainage. Small holes are cut into the sides where short-rooted vegetables such as Indian spinach and tomatoes can grow. Long-rooted vegetables such as gourds grow on top. 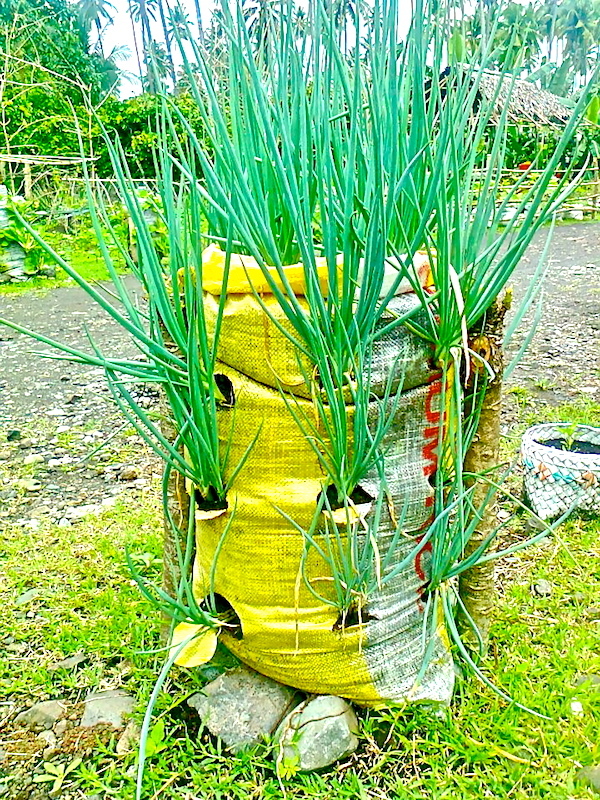 These sacks can produce up to eight kilograms of vegetables in one season with an investment of 100 to 150 taka (about $1.30 to $2) per bag. The tower variety of container measures more than 1.2 meters across and can produce more than 100 kilograms of vegetables. One tower requires an investment of about 900 to 1,000 taka (around $11.50 to $13.00) to buy materials and seeds. WorldFish provides seeds and some materials to villagers in the first year. In Bangladesh, more land is becoming salty and unfit for growing crops. It’s a pressing problem in this densely-populated country where most people farm for a living. But even on saline land, villagers can grow bountiful “vertical gardens” from soil flushed by monsoon rains. In Chandipur village in southwest Bangladesh, lush vines sprouting pumpkins and gourds cover the tin roofs of small homes. 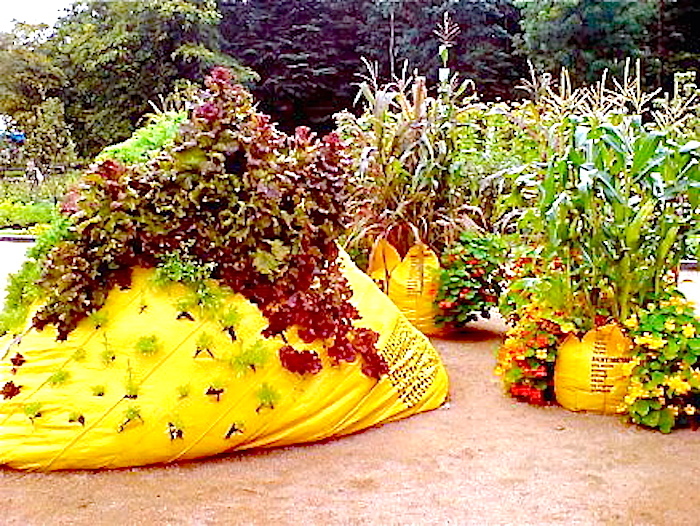 This bounty sprouts from an unlikely source: large plastic sacks on the ground and other containers. But for three years, hundreds of villagers have grown “vertical gardens” – essentially vegetables grown from plastic sacks, giant containers made of plastic sheets and bamboo, as well as other receptacles. Most of Bangladesh is at or below sea level, so the country is highly vulnerable to climate change. Storm surges in coastal areas add to the problem of increasing salinity. More than half of coastal areas are affected by salinity, which makes land less productive. This is a pressing concern for densely populated Bangladesh, which has 156 million people. 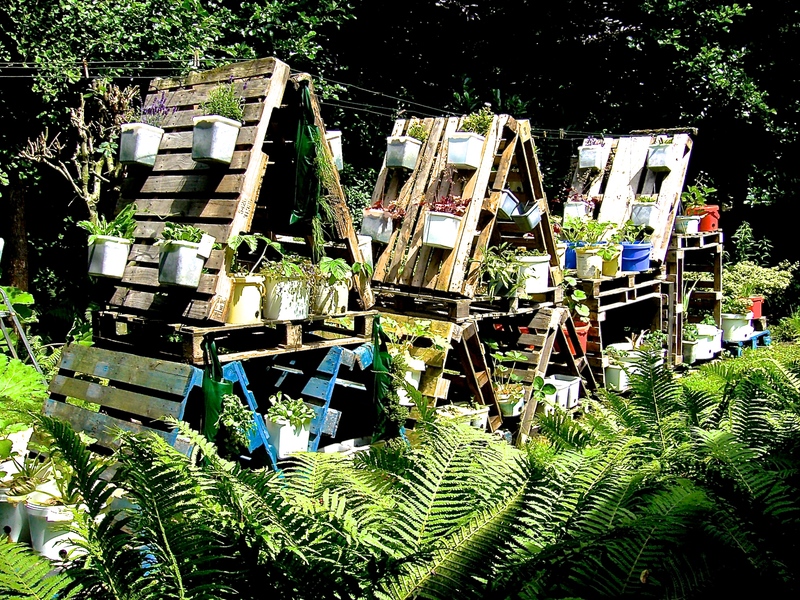 Vertical gardens are one simple way that people can adapt to climate change and grow food. 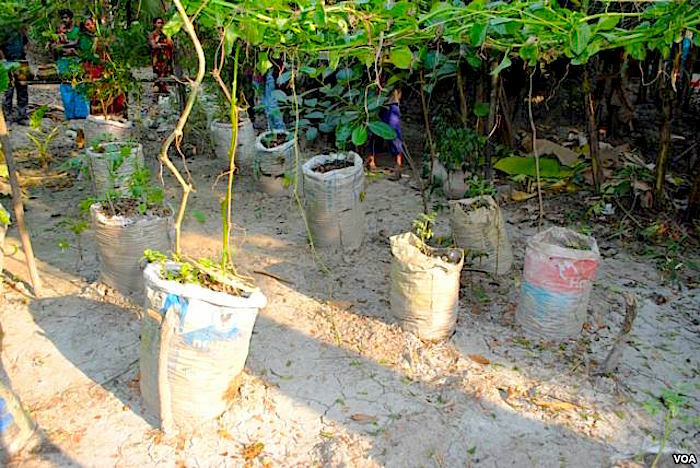 WorldFish Center, an international non-profit, introduced vertical gardens in Bangladesh. Photo taken at the start of the community garden photographed 12 years later by Willemien (see photo of 2009-02 in Niou). At the first training session, the local women learn how to apply the soil conditioner TerraCottem. Do hungry people need trees or a garden? Dear Friend, You are completely right. All those big projects are doomed to be unsuccessful, simply because a number of limiting factors (like water) will always hinder the achievement of the goals. Instead of spending all the good money at reforestation without taking care of the hunger and poverty of the local people, foreign aid should concentrate on agro-forestry, creating small family gardens and surround these with fruit trees (these are TREES too). 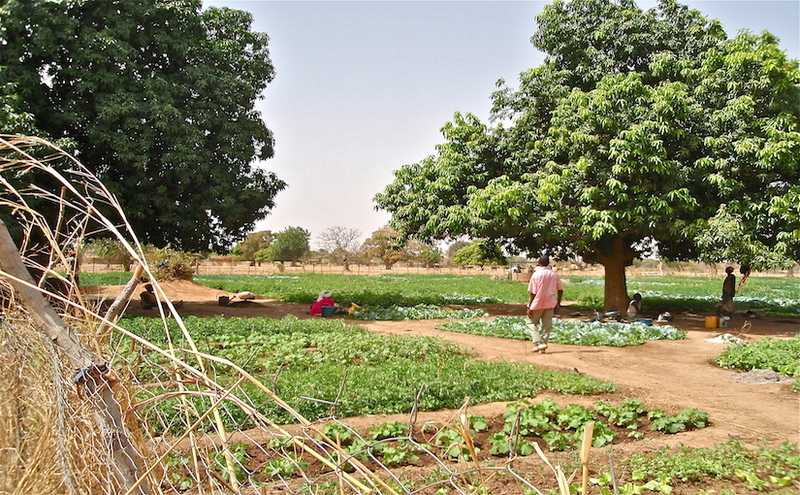 2009-02 – Burkina Faso, Niou village, Jardin des Femmes: community garden combined with mango trees, created in 1997 by the Belgium TC-Dialogue Foundation in cooperation with the Committee Maastricht-Niou for the local village women’s association Gueswende. We should not look first at economic return on our investment, e.g. planting trees and shrubs for biofuel, but first of all eliminate hunger and diseases in a region, which is a conditio sine qua non to count on the collaboration of the local population at bigger reforestation projects in the future. How can we ever justify that we ‘help‘ the local people if our main objective is to gain ‘something’ for ourselves? For me, there is only one solution: first help the local people to decent food and then see how they can really help us to create return on investment. 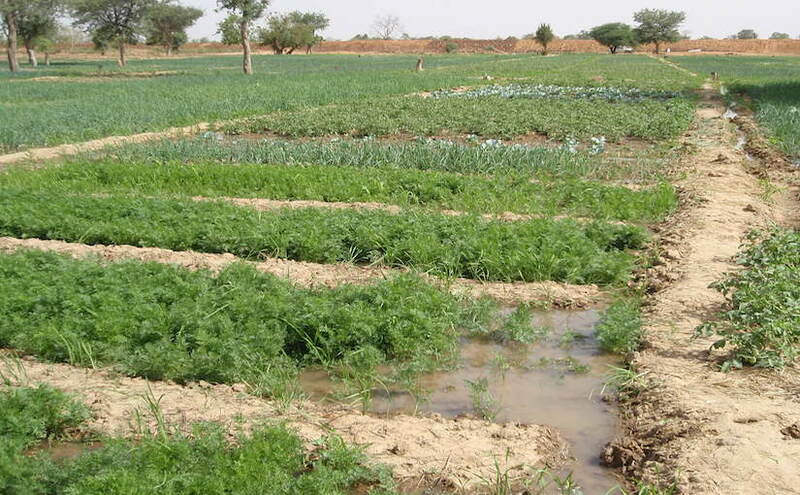 2009-02 Burkina Faso: Jardin Kabouda, a community garden created with the support of the Committee Maastricht-Niou. A splendid example of combating hunger, child malnutrition and poverty. Unfortunately, it has been and still is always business as usual, even for some international organizations, surviving thanks to the unsolved problems like hunger, child malnutrition and poverty, for which billions of dollars are repeatedly collected, without changing much at the grassroot level. I get tears in my eyes, thinking at all those poor people out there, seeing how billions are spent year after year at what is called combating the problems. 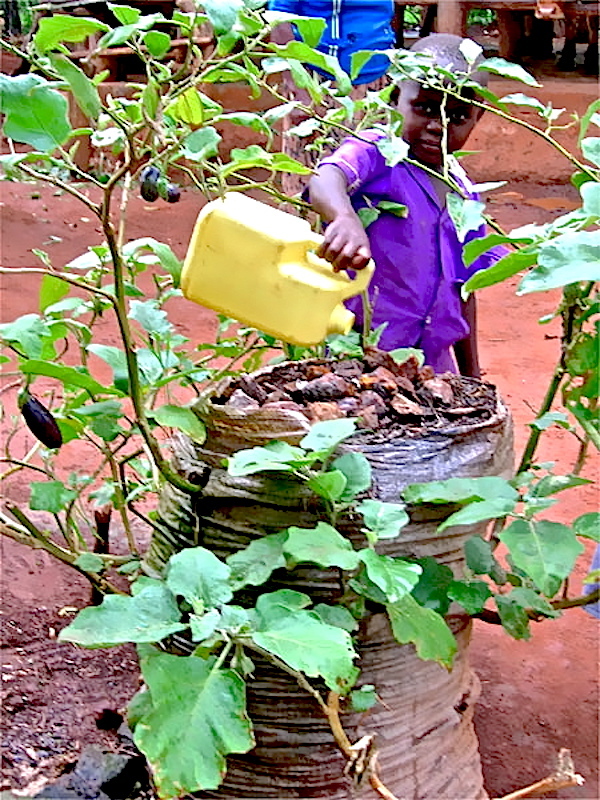 Hunger, child malnutrition and poverty should be combated in the field itself, at the grassroot level, by offering people a chance to grow their own fresh food and fruits in a private family (kitchen) garden or in a community garden (see photos above). We will never win that war if we continue to ship only food (the ammunition) to the frontline, not the necessary weapons (a fence, fertilizers, seeds, …) to create small gardens, the ideal platform for self-sufficiency. For sure: victory can be ours! Let us make the right strategic move. sostenible de cadenas productivas y sus actores en la región Ayacucho, Perú. de vida de las familias productoras. obtener un producto de calidad. desarrollo y mayores rendimientos de tara. Day after day, messages and photos or videos on the internet confirm that people feel the need to produce their own fresh food, even in the smallest available space, e.g. a balcony on the 17th floor in the city. It is marvelous to notice that most of these “novice farmers or gardeners” proudly announce the successes of their first experiments and the swift progress made thanks to “lessons learned” and “exchange of information”. Thanks to these personal initiatives of private gardening, the most vulnerable part of the population in developed countries is less affected by the food crisis, in particular by the high food prices. “If a large group of people in developed countries, affected by the actual crises and suffering from hunger or malnutrition because of the high food prices, is successfully setting up actions to produce an important part of their own food, why don’t we teach the billion hungry people, mostly living in developing countries, to do the same ?”. The answer to this question seems to be a very difficult one. My Chinese friends are telling me : “Don’t bring that hungry man a fish that he will eat in one day, but teach him how to fish and he will eat all year long“. As Chinese is not my mother tongue, I translated it into : “Don’t bring the hungry people rations of nutritious food that they will eat in one day, but teach them how to grow their own fresh food and they will eat all year long”.